We are the Windsor High School 3D Printing team! 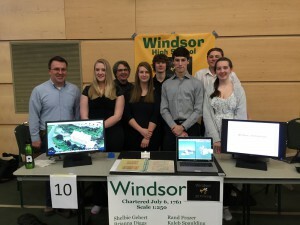 We are located in Windsor VT and we compete in the annual Town History in 3D Competition. Each year we pick a new historical building in our town, and then research and 3D model it. In 2015 we won the competition with our Windsor Post Office/Courthouse and American Precision Museum Models. The subject for 2016 was the State Prison in Windsor. Our focus in 2017 was Windsor architect, Asher Benjamin. In 2018 we modeled the Ascutney Mill Dam and Industrial area. 2019 features the Train Station and worker housing built between World War 1 and 2. You can view presentations, historical photos and documents, timelines and more here on our website! Feel free to browse and if you would like to contact us, use the contact page. Thank You! The Windsor 3D Printing Team would like to thank the American Precision Museum and the Windsor Historical Society for all of their assistance in researching the rich history of our buildings.